Presented by Vilija and Pam; be sure to bring your handwoven fabric, ideas and questions. Presentation will involve sharing ideas, materials lists, problem solving, embellishment suggestions, etc. Sewing the purse or bag will be homework! Five scholarships for the 2013 conference are available, one in each area of CNCH. The scholarship is for 12 hour registration to the conference and is not need based. Application forms are available on the CNCH web site. receive education and resources needed to lead better lives. We are Supporting the FUKUSHIMA CHILDREN since 2011! We love to see you all at the event on Sunday,11/03/2013 at 12:00 NOON. This is an AMAZING show and is being presented in our newly renovated, state of the art gallery, located 45 minutes from San Francisco, in the heart of the world famous wine country in Sebastopol CA. During the show, The Sebastopol Center for the Arts, is celebrating its 25th year, and this show is one of the showcases for our celebrations. As part of this new venture, the Sebastopol Center for the Arts has joined with the Surface Design Association and is featuring artists from all over the world in this unique celebration of fiber arts. I would like to invite you personally to this amazing show and I hope you will join us for our opening reception this Thursday, October 24, 6-8 pm (Opening Remarks & Awards will begin promptly at 6pm and reception to follow)MAP HERE. A special thanks to our jurors Susan Taber Avila & Joan Schulze and the hard work of show coordinators Bill Yoes and Joy Stocksdale. Please share and forward this invitation with artist friends or associations. We are raising the bar of fiber art in our community and we look forward to sharing this ground breaking show. Join Alaskan native artist Teri Rofkar at the San Jose Museum of Quilts & Textiles to experience the ancient art of Tlingit weaving, a form of traditional native weaving that predates the pyramids of Egypt by over 6,000 years. Tlingit baskets and robes are a reflection of the rugged coastline of glaciers and towering mountain peaks that skirt Southeast Alaska. Using all your senses, explore the very tops of the mountains, and the deepest forest floor during an afternoon open artist studio and demonstration. 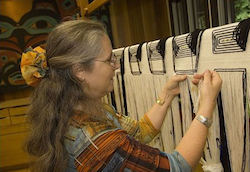 "Decades of weaving have opened my eyes to the pure science that is embedded in Tlingit Art...[bringing] knowledge of ten thousand years of research to life." 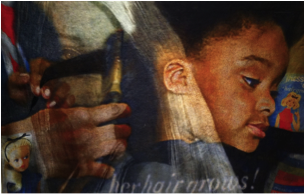 showcases works that are both conceptually groundbreaking and visually stunning. The show features 40 works from a diverse group of 37 national and international artists, both acclaimed and emerging, and explores a wide spectrum of textile practices. The Waldorf School of the Peninsula High School in Mountain View is interested in selling the looms and other items listed below. The buyers would be responsible for moving them from storage in Sunnyvale. (In other words, you would have to bring two strong people and a truck or van.) At this point, we are considering bids, but may set minimum prices. Please contact Dotty Calabrese at dottycala@aol.com if you may be interested in any of the looms, tools, benches, etc. listed below. If there is enough response, we may be able to arrange a day for viewing them. Eight different loom benches are available. Various shuttles, yarns, and books.